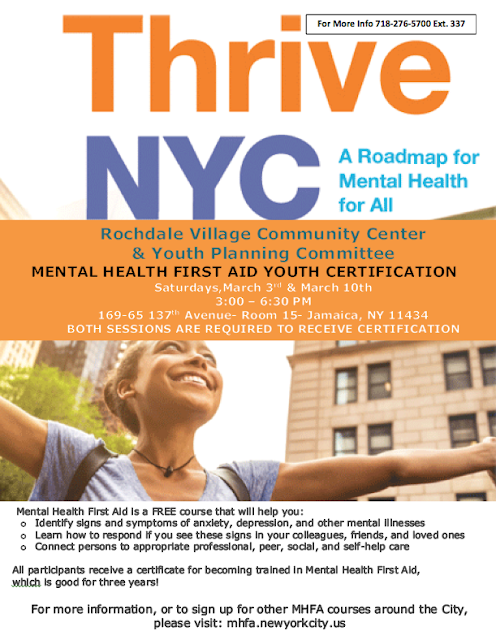 Thrive NYC and the Rochdale Village Community Center are pleased to present Thrive NYC: A Roadmap for Mental Health for All. Join them as they present a two-part (March 3rd and March 10th) “Mental Health First Aid Youth Certification” course. Both sessions are required to receive certification. Labels: Thrive NYC and the Rochdale Village Community Center are pleased to present Thrive NYC: A Roadmap for Mental Health for All.